After Sophie Marceau and Kristen Stewart, here is an article about the chameleon Matt Damon. To make a chess player joke about Matt Damon, astrologers could title our article "Success and Matt". Indeed, the actor was born under a lucky star, in his case, with a strong Neptune on the Midheaven axis. When this planet is prevailing, it describes inspired artists, especially in the fields in which sounds and images are important. Which fits... the cinema. However, for a long time Matt Damon chased roles as an extra, then supporting roles, before his career took off. It might be brought about by Neptune's uncertain and unstable nature, of course, increased by the predominance of signs preferring shadows to bright light. Let's recapitulate: with the Sun in Libra, Matt Damon displays the sign's civilised and gentle characteristics, as well as a good upbringing. Coming from a well-off family, he first studied at the prestigious Harvard University. In Damon's chart, Libra has a tinge of Uranus, the planet conjunct his Sun and ruling his Aquarius Ascendant. In his youth, Damon was probably a slightly revolutionary intellectual. Uranus being Mercury's higher octave, the influences of Air signs and of this planet endow him with a brilliant mind and with the will to find his place in society. But it required time. Did he conceal some sort of complex, such as the fear of being unloved, owing to the tight Venus-Saturn opposition? Indeed, the two planets associated with Libra seem to fight for the seat of honour. Whereas Matt Damon declares that he wanted to become a comedian very early, his first performances in theatre plays went almost unnoticed. Slowly, after a first success on the stage, he entered the mecca of the cinema and began in... "Mystic Pizza", a title for an unpretentious comedy, featuring another big star in her first role, Julia Roberts. Let's underline that Scorpio also deeply impacts on Damon's personality. Therefore, it is not surprising that, on the one hand, he persevered although several parts were not given to him but to better known actors, and on the other hand, that he finally imposed his style. 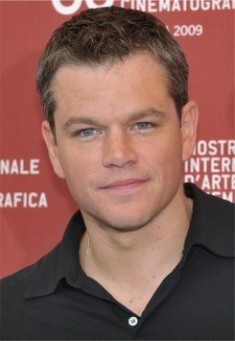 Whereas he cultivates the neat look of Mr. Everybody, Matt Damon can be a real chameleon. In this regard, he is like Leonardo DiCaprio, also marked by Scorpio and Libra, but whose charisma and fame were more quickly acknowledged that in the case of Damon. Matt Damon stood out when he played the role of characters typical of these two autumn signs. First, "Saving Private Ryan", in line with Spielberg's obsessions, who evokes Scorpio facets, with the recall of the tragic World War II context. Thus, Damon plays Ryan, a soldier who had three brothers killed in action, and who is himself missing in action. Then, another big success which seems more related to Libra: "The talented Mr. Ripley", a story enfolding in the fifties in Italy, where the life of the gilded youth is so attractive that the hero goes as far as committing murders in order to preserve an affluent lifestyle... One must not forget Damon's remarkable performance in "Good Will Hunting" in 1997, by Gus Van Sant, who elevated him – as well as Ben Affleck – to stardom. He successfully tried his hand at very diverse genres. After war films and comedies, he starred in westerns and even as the lover of Michael Douglas in "Behind the Candelabra". It is interesting for the astrologer to examine how this type of chart enables him to explore his female side, yet without losing his subtle virile charm. Now at peace with his own journey, Matt Damon expresses more strongly the gentle and altruistic values of Libra and Aquarius. Indeed, he is deeply committed in humanitarian causes, and takes advantage of his fame. We save the best for last. What is probably the major asset of Damon's natal chart, and promises a long-lasting career, is a beautiful Grand Trine linking the Moon in Capricorn, Saturn in Taurus, and the Mars-Pluto duo on the late degrees of Virgo. They form a kite pattern, which brightly highlights Neptune on the Midheaven. What a wonderful indication that one will earn one's place at the top! The only reservation is the lack of Fire, which confirms again the reasons why he had to wait until the initiative is taken by someone else before he could spread his wings. You can also read the Astrotheme astrological portrait of Matt Damon. In 2014, Matt Damon is back at George Clooney's side in "Monuments Men". He seems to have gone through the turbulences of the first semester rather quietly. By the end of the year, Saturn arriving on his Midheaven requires caution, because the planet is part of the dominants. But since it will not form very harsh aspects, it may mean experiencing maturity. Moreover, Jupiter will also reach the Descendant next autumn, which heralds very enthusiastic audiences. As far as progressions are concerned, it is mostly in 2015-2016 that new challenges will demand increased energy and concentration.